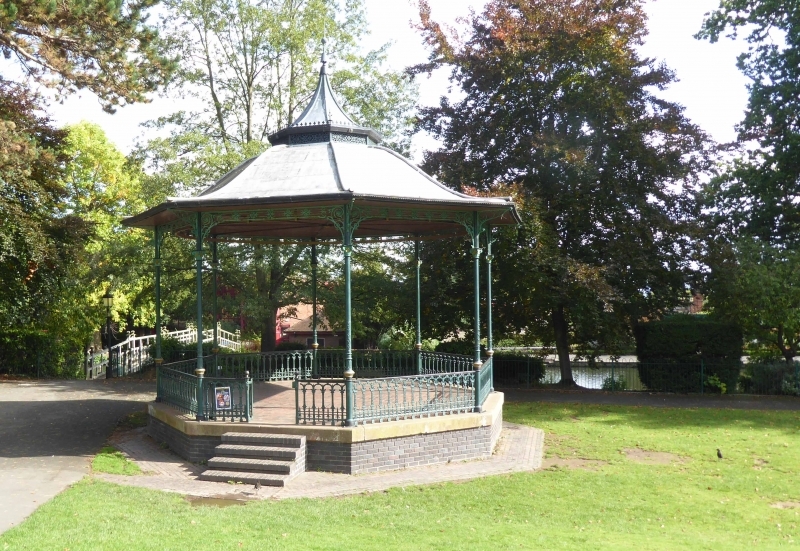 A bandstand, dating from the early-C20 of cast iron and timber construction, with a lead-covered roof and standing on a brick plinth. The building is octagonal in plan. DESCRIPTION: The building has a blue brick plinth of c.1983 with a stone coping to the edges, which appears earlier in date and may be original. Above this are eight, cast-iron columns, which rise to foliate capitals. The spandrels and cornice are of filigree iron. Below is a balustrade, also of cast-iron panels, with gates to the west side above a set of steps. The roof is ridged to the corners and has an ogee shape to its lower body, rising to metal grilles. Above this is metal cresting and the roof sweeps up to a spike and ball finial. There is a wooden ceiling with moulded ribs and a central boss with gilded star. Many of the blue bricks which form the new base have incised initials and names of organisations, presumably of donors who helped to pay for the removal of the building. A brick, dated `1983', is set at the centre of a tread on the staircase on the western side. HISTORY: An early C-20 bandstand which originally stood in Priory Park, Great Malvern. It was listed in 1979 in Victoria Park, Malvern Link but was removed from that park to its original setting in Priory Park, c.1983. SOURCES: Pamela Hurle, Bygone Malvern, (1989), illus.45. * The building is a good example of a decorative, cast iron structure of the early C20. * Despite the loss of the original brick plinth the bandstand is still notably intact. The commemorative nature of the present plinth with initialled bricks to mark the donors adds interest.